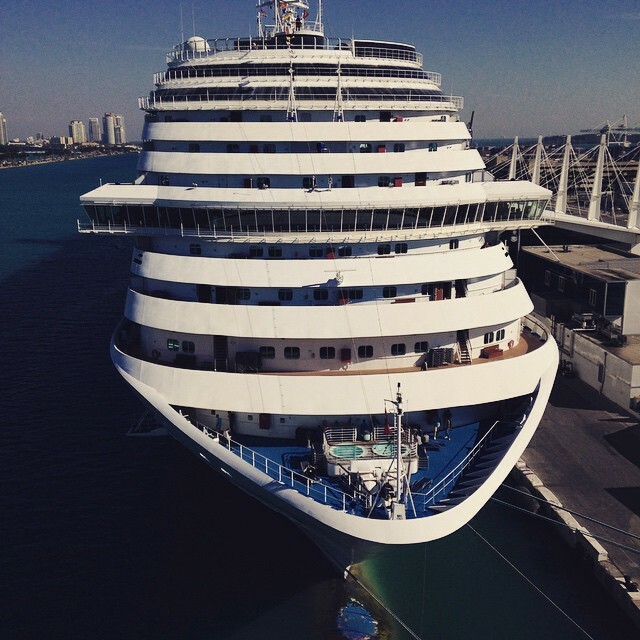 My goodness, I had such a good time on that cruise, and so much to tell you – so, so much. But I’ll get to it all in good time. Let’s get started with the tale of my first ever Carnival Cruise (a first I can cross off my bucket list) to the Western Caribbean. 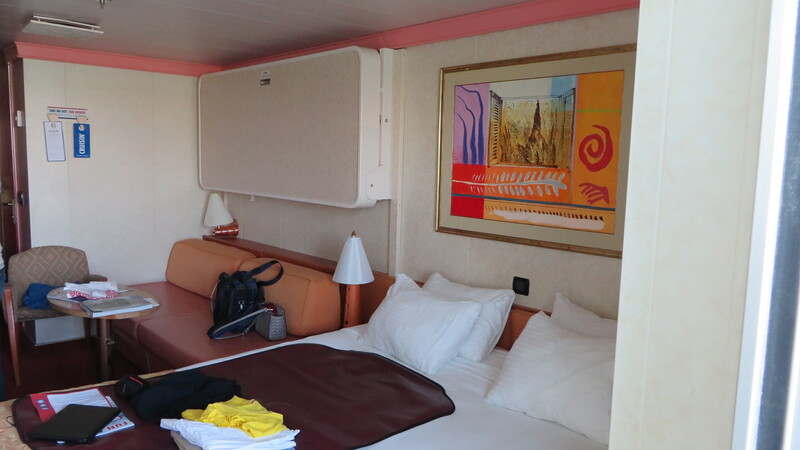 Seven days of fun, sun and visits to Costa Maya, Isla Roatan, Belize and Cozumel on the beautiful Carnival Glory over Valentine’s Day and Sean’s and my third anniversary of our first date. Are you excited yet? Look at the size of the cruise ship! So! Our excursion actually began on Saturday, Feb. 14 – yep, Valentine’s Day. Sean and I had a flight down to Ft. Lauderdale that morning, which deposited us at the airport at 10:45 AM. 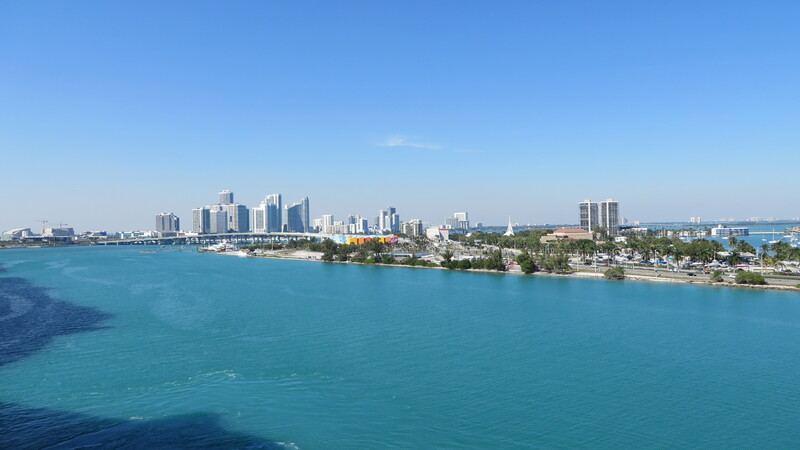 According to the itinerary, we didn’t have to board the boat until 1:00 PM, but to be safe, we decided to Uber right down to the Port of Miami and see if we could board a little early. When all was said and done (bags collected, Uber organized, etc.) we ended up at the port right around 12:30 – good timing and I was utterly blown away by the size of the cruise ships docked there. I’d been told our particular ship, the Carnival Glory was 110,000 tons, but seeing that in person takes your breath away. Massive doesn’t even begin to describe it – but I’ll get to that soon enough. We entered the port building, snaked through the lines to check in, dropped off our luggage that the porters would deliver to our rooms later that afternoon and were shortly on the cruise ship. Wow! People say it’s like a small city inside and they’re not kidding – we entered on the third floor, which had a big open seating area with a bar, a stage for live music, the excursion and guest services desks, some other small rooms for relaxing along with all the private rooms on that level, and banks of elevators going up and down from the bottom floor all the way to the 12th level. Behold, the Lido deck. Complete with water slide, of course. As soon as we were on the ship, we were directed to the 9th floor, the Lido deck, where we could have lunch while the rest of the guests got on board. 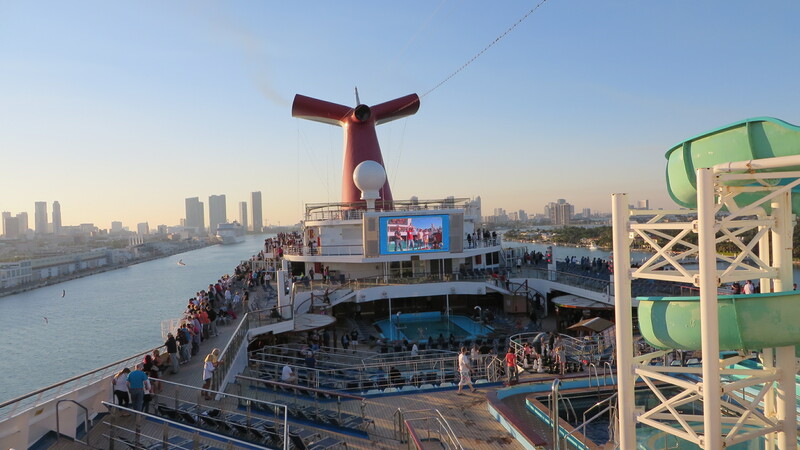 On the Lido deck, I got my first good look at the main pool and all the deck chairs surrounding (and many already occupied by eager sun worshippers), the Blue Iguana tequila bar, the Red Frog rum bar, the burger counter, the burrito counter, and inside the Red Sail buffet. Good lord: the food. The absolute amount and variety of food was simply astounding (and I came to realize quickly in the following days, the amount of waste must also be sickening). For instance, there were strategically placed froyo machines available to guests 24/7. Still getting our bearings, we grabbed some food from the first buffet we came to, only afterwards discovering the second around the corner, gazed out at the port and the people flooding onto our ship and others, and then began exploring. We found our room first, and I was pleasantly surprised by its size and efficient use of space. The bathroom was tiny, yes, the space was pretty narrow, yes, but despite this, it was quite cozy the whole time we were there and the balcony was a really nice addition to our stateroom. Interior ship designers have got to be the most space-efficient people on Earth. Then we made our way around the rest of the ship. We saw: the duty-free shops (both for expensive jewelry and watches and for alcohol and Carnival branded merchandise), the candy shop, the bar, the nightclub, the piano bar, the comedy lounge, the big performance theater, the formal dining rooms, the arcade, the gym and spa, the photo gallery and the casino. All on one boat! This doesn’t even begin to cover the size and scope of everything on the cruise. Midway through our exploration, we were summoned to our muster stations in case the boat was to encounter an iceberg on its journey and we needed to abandon ship. After learning how to secure a life vest and where to evacuate to in an emergency, we were again set free to roam, and we went up to the very top of the ship to see the walking track, the adults only lounge area (this became one of our favorite spots to sit and read) and the outdoor smoking sections (ew). When Sean and I returned to the room to take a rest, our bags had arrived at our door. We unpacked, listened to our cruise director “Dr. E” greet us over the intercom system, decided to make a reservation at the ultra fancy Emerald Steakhouse for our V-day dinner and relaxed as the Carnival Glory pulled out of Miami port, headed for the open seas. Goodbye, Miami! We’ll see you soon. By the time our reservation rolled around, we were definitely hungry and walked to the Emerald Steakhouse, which took all of five minutes, for dinner. The steakhouse was quite swanky: dark wood, plush seats and white tablecloths, smartly dressed servers – it was very nice, and our server that evening was excellent. We split a bottle of wine, I had the surf and turf, Sean got the 14 oz. NY strip steak and we shared a “special Valentine’s Day dessert,” which turned out to be a decadently rich, chocolatey confection. Boy, I was stuffed from the richness of it all afterwards. As you can imagine, after all the excitement of the day, we were whipped and fell asleep soon after getting back to the room. Our first full day on the Glory, was a day at sea, so after getting up at a leisurely time, we headed to the Platinum dining room for a sit-down breakfast. It was very pleasant being seated right near the window so we could see the ship cruising along as we ate our omelettes and pancakes and talked with our table mates. After eating we went to a presentation Dr. E was giving on excursions we could participate in at each of the four ports we were planning to stop at on the cruise – while listening to him and discussing among ourselves, Sean and I nailed down what we wanted to do: ziplining in Roatan and snorkeling in Belize; at the Mexican ports of Costa Maya and Cozumel, we decided to take it easy and just do our own thing. While Dr. E was presenting, he occasionally needed audience volunteers to help him out, which is how we learned there was a group of over 100 crocheters on the ship, when one came up to assist him and he pointed out her name tag. Everywhere we went from then on, I saw at least one bag of knitting needles and yarn. Ha! 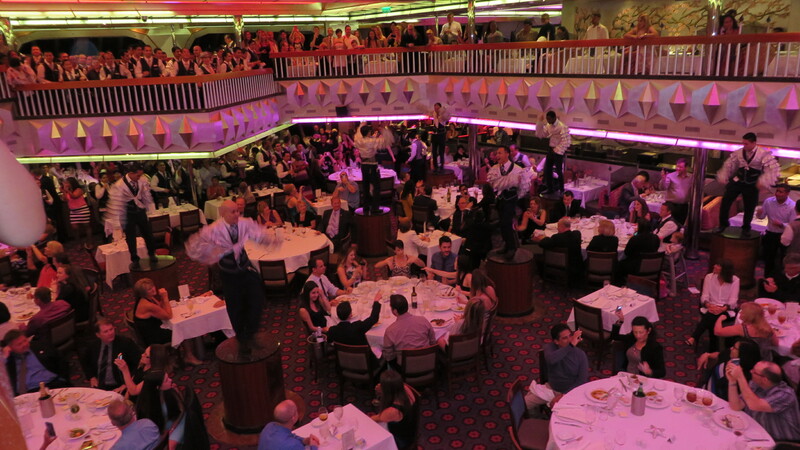 Here’s one of the four nights we were treated to choreographed dances by our dining crew! That evening was the first of two “elegant cruise” evenings on the Glory, which meant everyone got to get gussied up for a fancy dinner. Sean and I did too, and went to our regularly assigned dining room, the Platinum Room, for our first dinner there. Turns out we had the same wait staff the whole cruise, and they did a fine job. Our favorite server quickly became Wijaya (Wi for short), because he was so friendly and always seemed to be in a good mood. And he told us when the crew would perform for the diners. As we headed south, towards Mexico, the weather was finally getting warmer – it was nice enough now that you wanted to be outside on the deck, so after dinner, Sean suggested we go for a walk around the ship. We walked up to the front and found the adults only area empty for the night, so we snagged one of the oversized hammocks and lay back to look at the stars. This was the evening of the third anniversary of our first date, so I said to Sean, “Did you think that three years after our first date, we’d be on a cruise in the Caribbean together?” Instead of answering my question, he said, “Let’s make it for the rest of our lives,” and pulled out a diamond engagement ring. 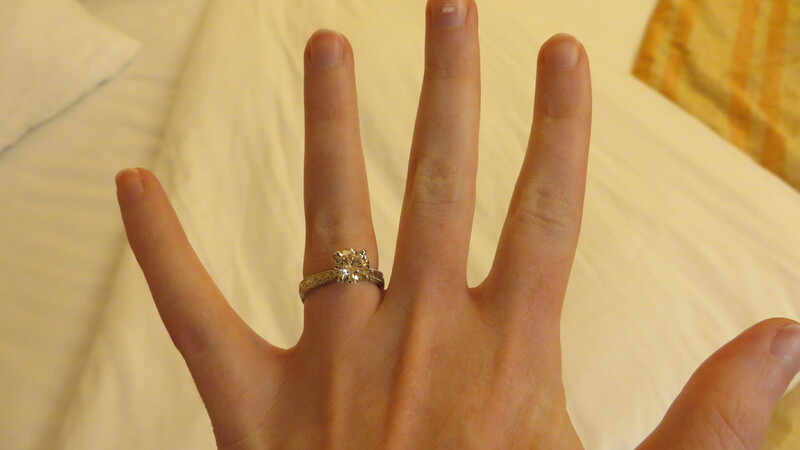 On a cruise, off the coast of Cuba, under the stars, my boyfriend asked me to marry him! As you might expect, I started crying tears of happiness, said, “Yes!” a thousand times and couldn’t stop smiling all at once. As we finally got up from the hammock to go to our room so I could see the ring in proper light (it’s the most beautiful one I’ve ever seen, by the way), I noticed even he was a little misty-eyed, which just made me tear up even more. Needless to say, I’ve been getting choked up about it many times since then – I can’t help it, it makes me so happy and overwhelmed at the same time. Oh. My. God! It’s so beautiful, I couldn’t love it any more. When we got back to the room, Sean opened a bottle of wine we’d brought with us; its name just happened to be “Monogamy” and I couldn’t wait to get into port the next day in Costa Maya so we could call home and tell our families. This really was turning out to be the best cruise ever. Stay tuned for my next post when we go ziplining, snorkeling and more! I wasn’t joking. Karma was really on our side for this trip. This post is part of the monthly link up party Our Growing Edge. This event aims to connect food bloggers and inspire us to try new things. This month is hosted by Kim from Love Live Life by Kim. This entry was posted in Caribbean, Florida, North America, United States of America and tagged Caribbean, Carnival, Carnival Cruise, Cruise, Cuba, Engaged, Engagement, Engagement Ring, Florida, Miami, Ocean, Ring, Sea, Travels, United States of America, Valentine, Valentine's Day on February 28, 2015 by Paige N..